Garden Hose Water Connection Kit comes complete with everything you need to attach your Hydrofogger or Minifogger to a standard 3/4" garden hose. 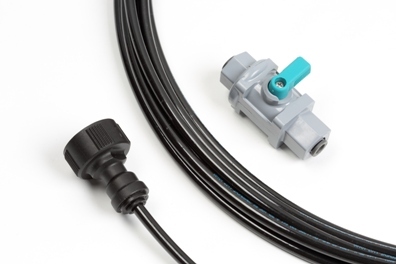 This connection is used in areas where the Hydrofogger or Minifogger will be supplied water by a standard 3/4" hose. Typically these areas are greenhouses or other agricultural applications. Kit contains a 3/4" Garden Hose Adapter which you will screw on to the end of your hose. Simply then attach the 1/4" tubing to the adapter, splice in the Shut-Off Valve, and attach the other end of the tubing to your fogger. Gently turn on the hose, starting with minimal water pressure to begin feeding water to the fogger. Take care not to use too much pressure as overflowing can occur. Also included is 25 feet of 1/4" Black Polyethylene tubing as well as a Hydrofogger Shut-Off Valve. Shipping & Handling is free when ordered with a Hydrofogger or a Minifogger.